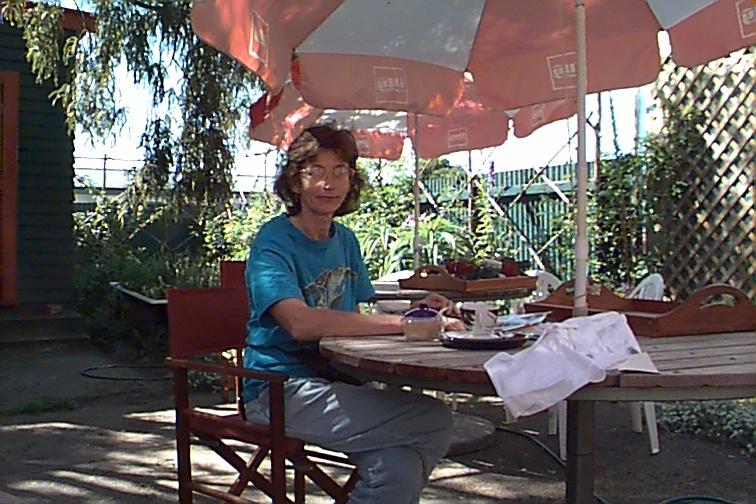 Morning coffee in Tiahape. Guess who's just had a nice chocolate cookie? 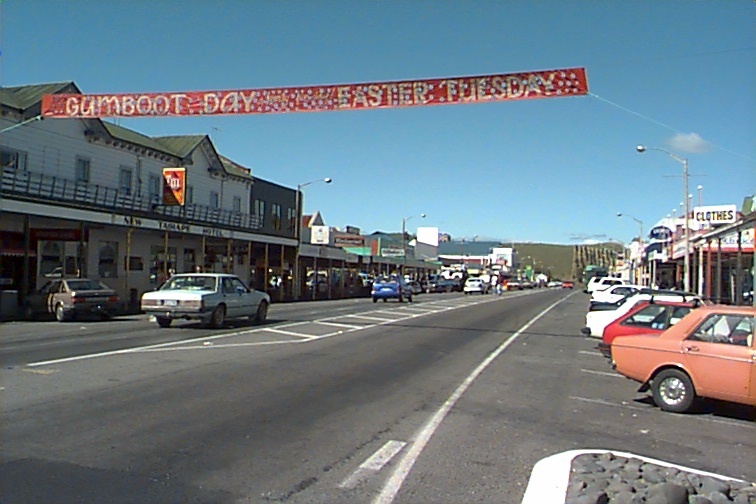 The Main Street in Tiahape (Tia == angle, hape == crooked) -- note the gumboot sign. You just know you have reached the center of excitment with the big event in town is the annual gumboot (i.e. rubber boot or Wellington) throwing contest. Unfortunately(?) we were a couple of days early and could not stay for the event. From Tiahape we drove north to Waiouru (Wai == water, o == of, uru == west). This is a small community on the edge of the major army training area (you guessed it, desertlike, hilly and of little other use). The town is also the location of the army museum which we visited for an hour or so. There was a very interesting collection of weapons from the Maori wars through to Vietnam, with emphasis on Gallipoli and the Greek/Crete campaigns. While quite a large collection of items, much of it was not very well labelled. Hauntingly, one enters through an memorial hall where the names of the dead are announced continuously -- that and the pictures of the wounded graphically display the steep costs that New Zealand, a country of only 3.5 million, today, has paid over the 150 years of its existence. "The great mountains in the heart of the North Island were once Gods and Warriors of great strength. To the north west of Tauhara stood Pihanga whose fame and beaurty was widely known. Each of the four mountains, Mount Egmont(Teranaki), Mount Ngauruhoe , Mount Tauhara and Mount Edgecumbe or Putauaki (Bay of Plenty) wooed her and wished her to be his wife. Pihanga could not decide which one she would marry. Puhanga aroused the passions of the giants -- she made the great giants, the volcanoes, tremble! They became silent, gathering strength. The rumblings grew into a crashing thunder and Tongariro erupted a fiery mass of molten stones. The battle had started and raged for many days and nights. 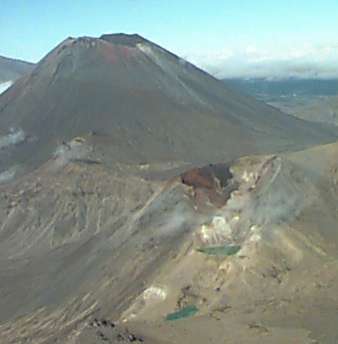 Tongariro emerged victorious. He became the Supreme Lord over the land and the proud husband of Pihanga. Mount Egmont followed the setting sun to Taranaki and got there by following the winding path of the Whanganui River. Tauhara and Mount Edgecumbe decided to travel towards the sea and look towards the dawn. They had to complete their journey in one night. Tauhara moved very slowly as he was sad and sore and only got as far as the north eastern shore of Lake Taupo and looks broodingly across at Pihanga and her proud husband. Mt Edgecumbe moved quickly northwards and wehn the morning sun rose he found himself at the northern end of the Kaiangaroa Plains -- 160 kilometers from where he originally stood. One day, perhaps they will rise up to return to the realms of Tongariro to seek revenge. Who knows?" 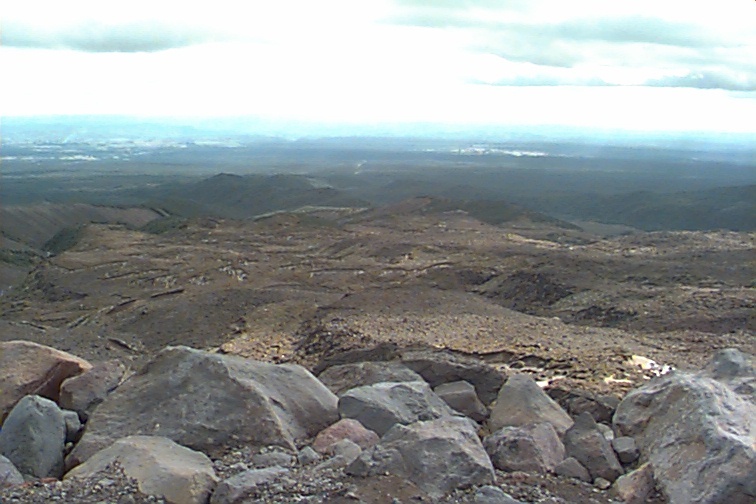 In the photograph the gods are, from left to right, Ruapehu, Ngauruhoe which obscures Tongariro from this angle, and Pihanga, just barely visible. 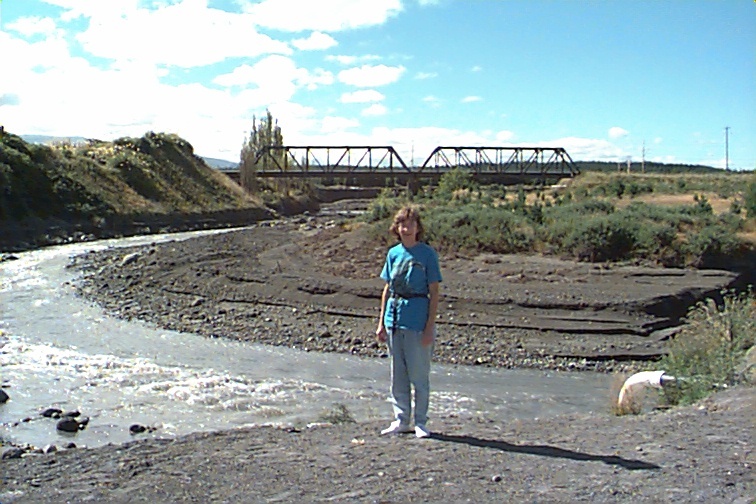 We next stopped at a river just a few kilometers outside Wiaouro -- scene of a tragic train crash on Christmas eve 1953 -- Christine stands on the banks of the river with the rebuilt railway bridge in the background. About every 50 years or so an icejam on the mountain will suddenly break sending a flood of water down the river. This happened on Christmas eve just before the express train from Auckland to Wellington appeared. It plunged into the river because of a weakened bridge, killing 151 people. We stopped for a few minutes at the memorial. The banks of the river are particularly black as a result of the recent eruptions of Ruapehu. We followed highway 49 along the south edge of Rangataua Forest which is on the lower slopes of Ruahape for a distance of 27 kilometers to the town of Ohakune. The road, as with all the roads around volcanoes passes over many rivers which radiate out from the peak. 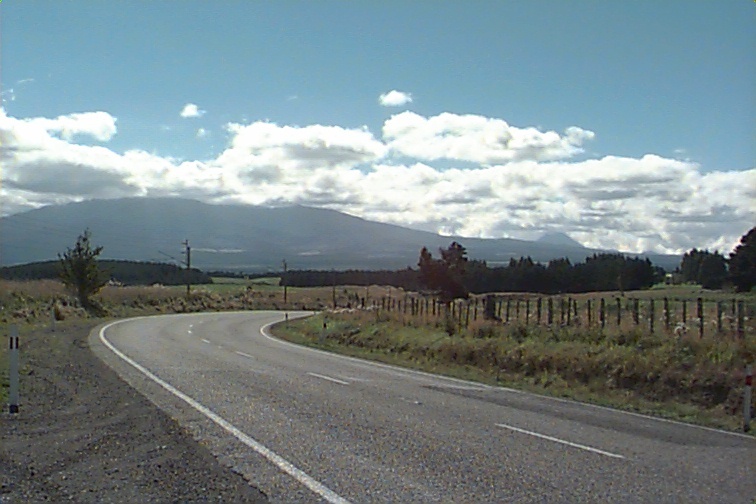 The road itself is fairly winding, but at all times on the right was the dominating image of Ruapehu. At Ohakune we turned north east along Mountain Road and made our way towards the peak of Ruapehu. 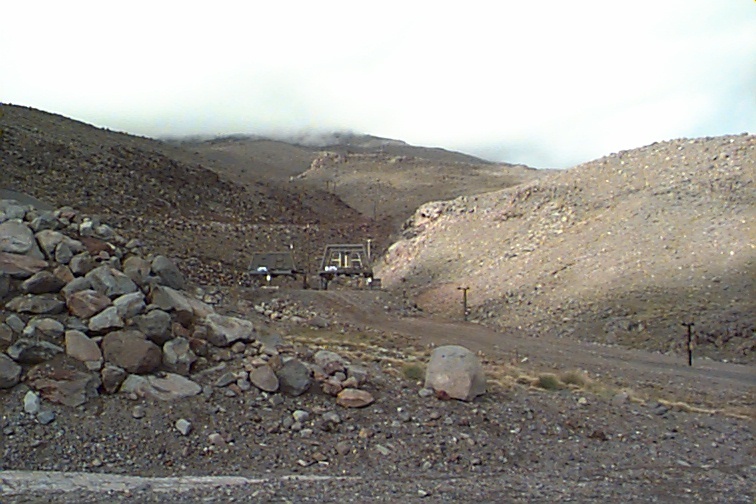 The road terminated well up the slope of the volcano, and above the tree line at the base of a ski lift. This being late summer there was no snow and the lift was closed. The following photos show the stark nature of the upper slopes of this volcano that last erupted in 1995-1996 and was still spewing some ash last August.The first is a view towards Ohakune, the second is a view towards Waiouru (to the southeast) , and the third is a view up the mountain at the foot of the ski lift, looking up towards the peak of the volcano, which is above the clouds. By this time it was mid-afternoon. We decided against a climb up to the peak, and instead opted for an hour stroll to a waterfall on the lower slopes. As with all strolls in New Zealand, this necessitated climbing a few hundred meters on a mountain trail. 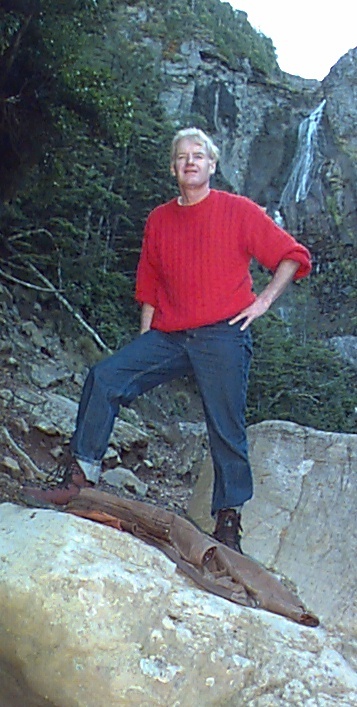 The photos show Ken and Christine at the foot of the falls. On the top of the hill that we climbed over to see the waterfall was a piece of terrain which was very much like muskeg. It was a licken and moss bog area and to provide a trail over the terrain a raised wooden walkway had been built. 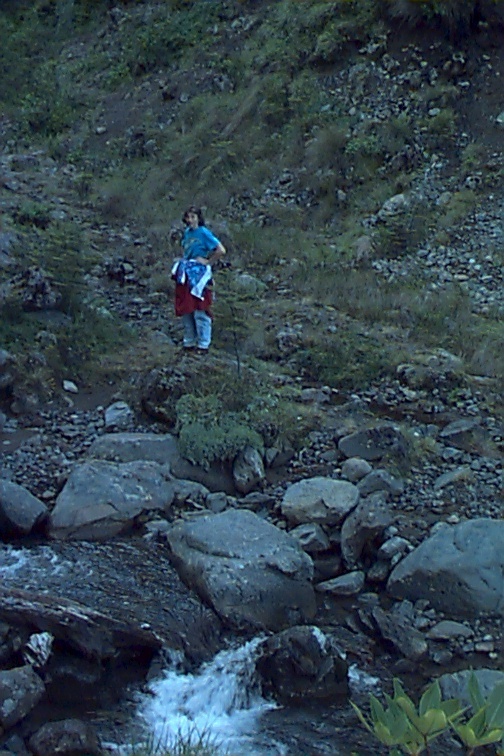 This walkway, an alpine pond, and a well dressed tramper are captured in this photo. 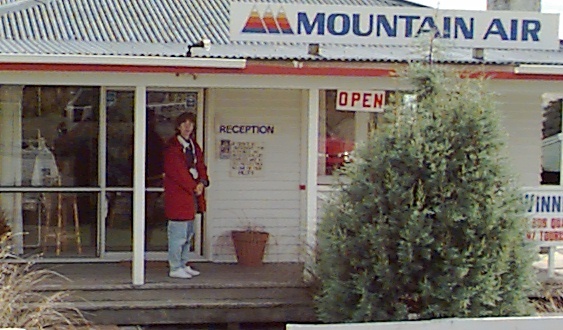 We returned down the mountain and spent the night in Ohakune. 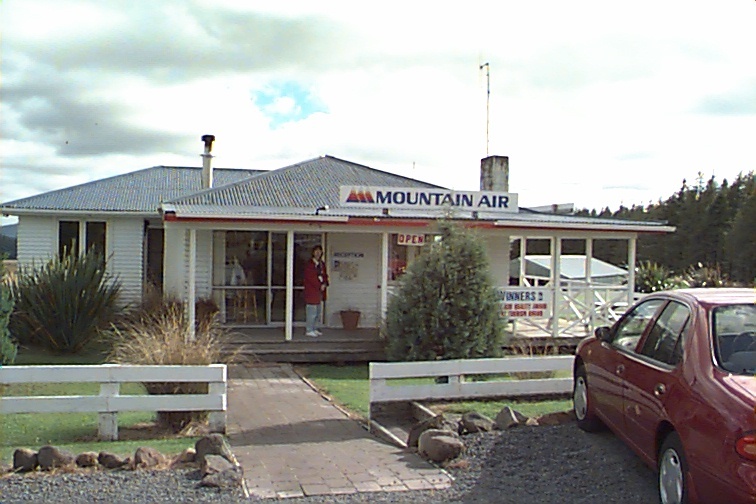 We had a nice meal in a restaurant for about $40 including wine, and spent the night at the Ohakune Mountain View Motel. The room which was self contained and had tea and coffee making facilities was $60 for the night. 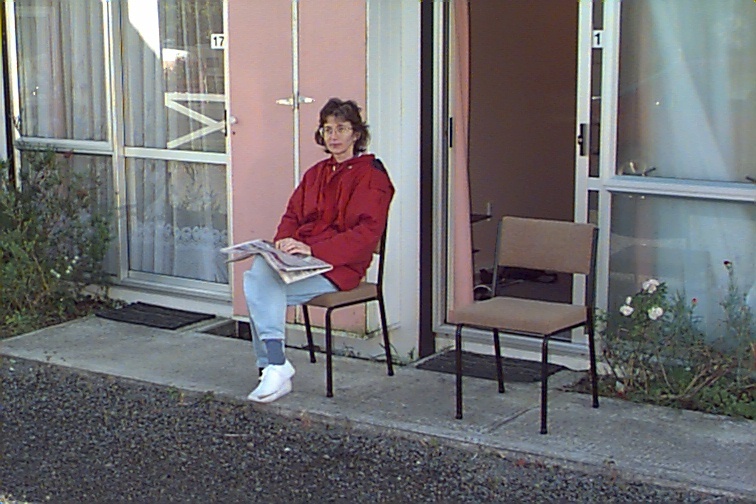 In the morning (luckily the volcano did not erupt in the night and obliterate the town) Christine caught up on the world news. The next morning we started to head north again. From Ohakune we continued west on highway 49 to the intersection with highway 4 which we turned north on to National Park. From there we took highway 47 to the northeast. All this time Ruahepu was much in evidence as we were, in essence, driving around it in a clockwise direction. A few kilometers from National Park we reached the junction with highway 48 which goes directly towards the mountain and to an other ski area. This area is the site of "The Chateau" which is reputed to be a very nice hotel. 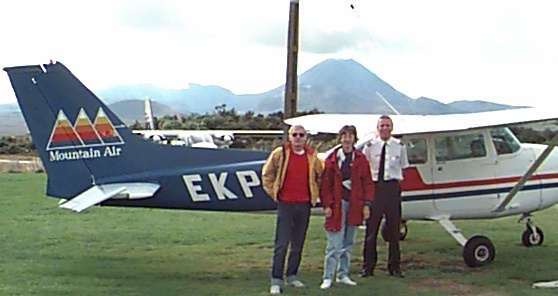 However, more striking to us at this intersection was Mountain Air, a small airport and airline that specializes in flights over the volcanoes. We were hooked. 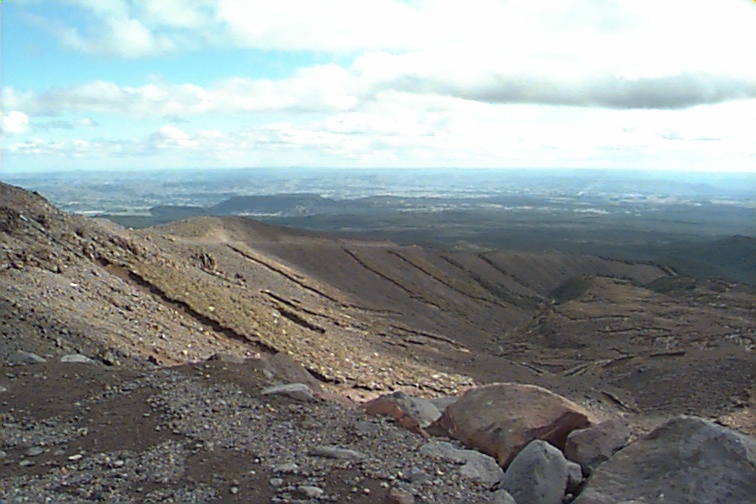 For a cost of $110 each we were given a 40 minute ride over Tongariro (1968 meters), Ngauruhoe (2291 m.) and Ruapehu (2797 m.). 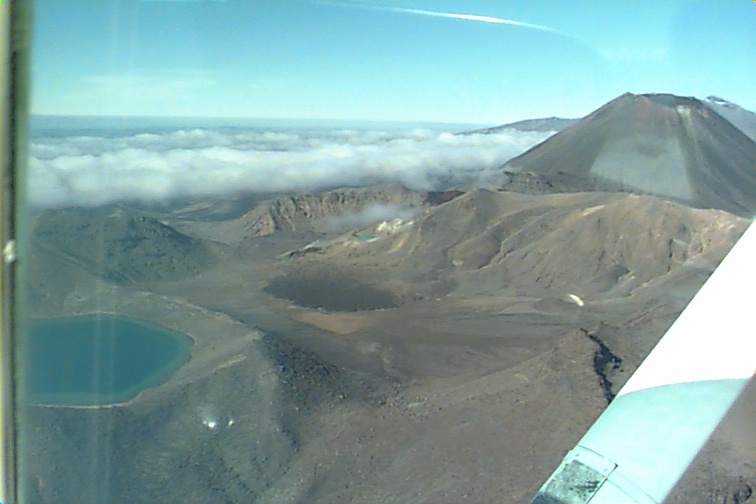 The flight was made in a climbing fashion starting first with the lowest and northernmost volcano, Tongariro. 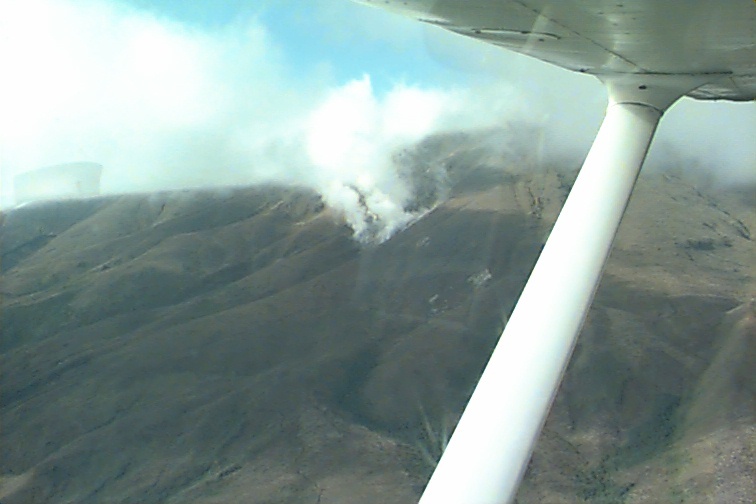 On the north side of this mountain (at about 11 o'clock position)are the dramatic Ketetahi Springs area which generate large clouds of steam. In this photo we are still below the clouds. As we climbed we moved around the mountain to about the two o'clock position and, now over the clouds had a fabulous view of the Blue Lake, a flooded crater on the top of the mountain. 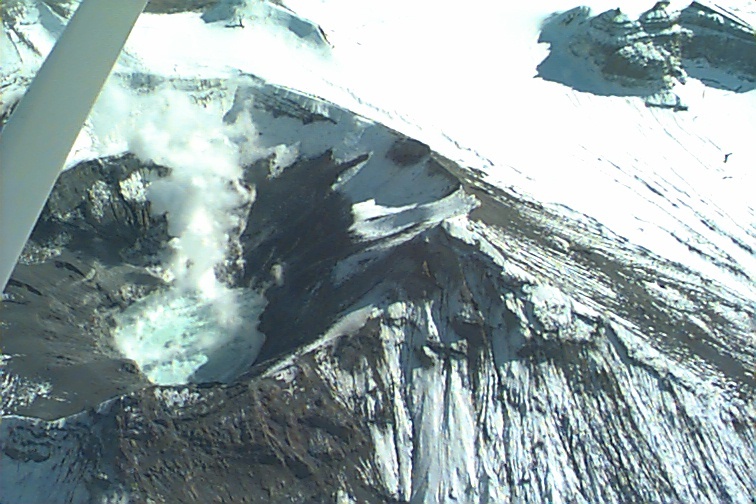 By now we had enough altitude to see, looking south, the summits of all three volcanoes over the console of the aircraft (a Cesna 172). This view alone made the trip worthwhile. We continued to climb and next saw the Emerald Lakes, one of which appears in this photo, with the perfect cone shape of Ngauruhoe in the background. Next we see, in a superb alignment, the red crater of Tongariro, with the Emerald Lakes in the foreground, the cone of Ngauruhoe behind, and in the left background the start of the slope of Ruapehu. 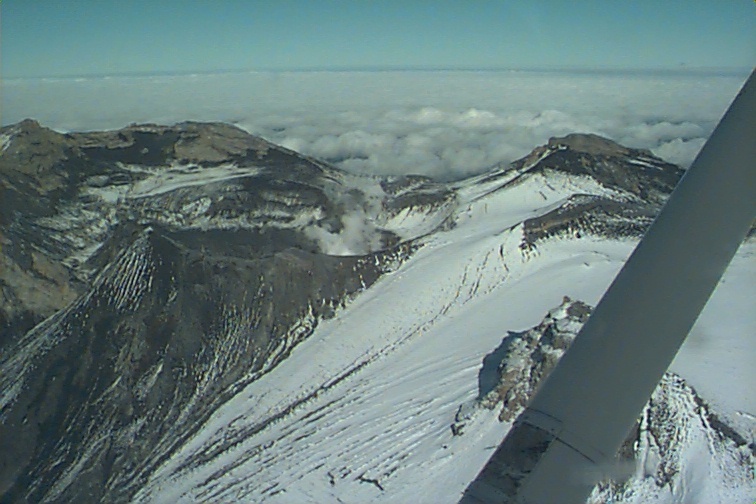 Next we climbed above Ngauruhoe and circling from the south obtained this lovely shot down into the cone of the mountain. The shot is clearly taken from the south as the shadows indicate since the sun is in the north. 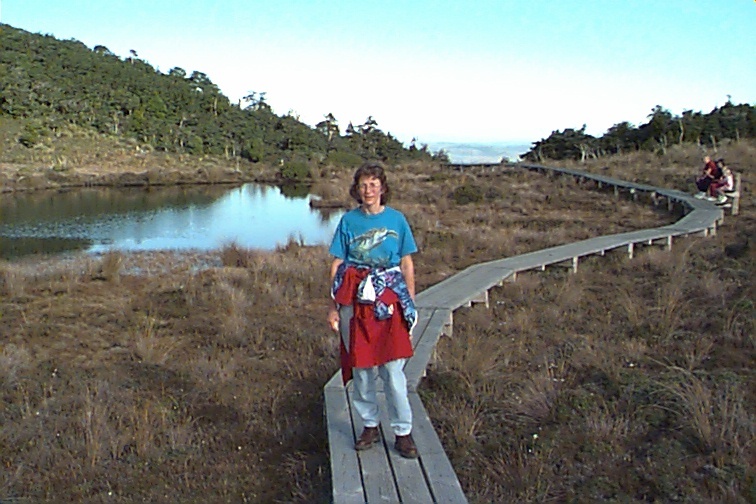 Continuing our climb and coming further south we arrived at our destination above Ruapehu. Higher than the other volcanoes it is snow covered year round, however, the mountan has a steam emitting poolwhich, clearly visible in this photo can be seen from many kilometers away. Higher yet, and closer, we can see the blue lake with its steam emmission. 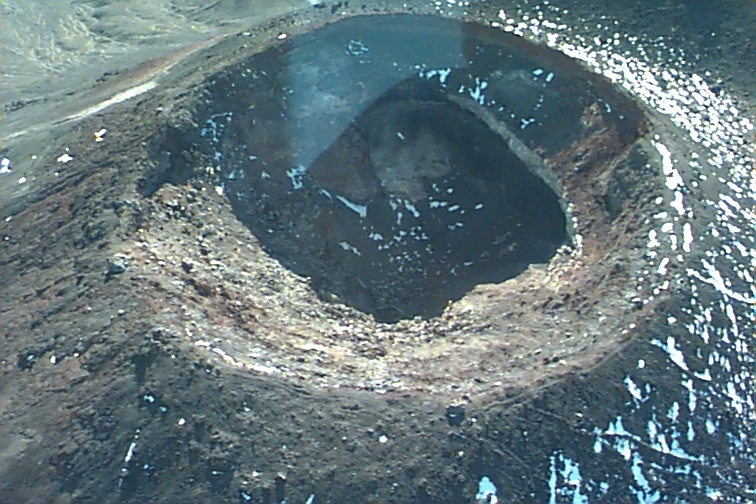 Also visible in this photo is the black ash that has spewed from the volcanoe in the last year.The lake is also warmer now than normal because of the eruptions. This completed the major portion of the flight, and it was left now only to descend back to the airport. 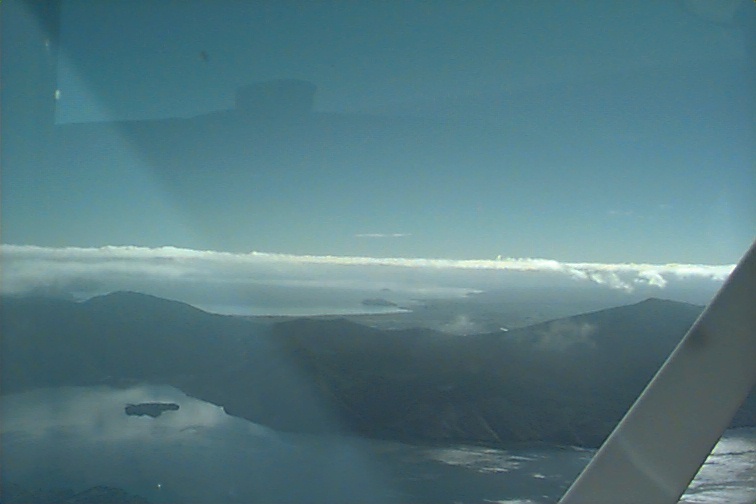 But look, there on the western horizon, just barely visible above the clouds and in the haze of the distance, is the cone of Teranaki which we had visited on Feb 21! A perfect ending to a flight we will never forget.